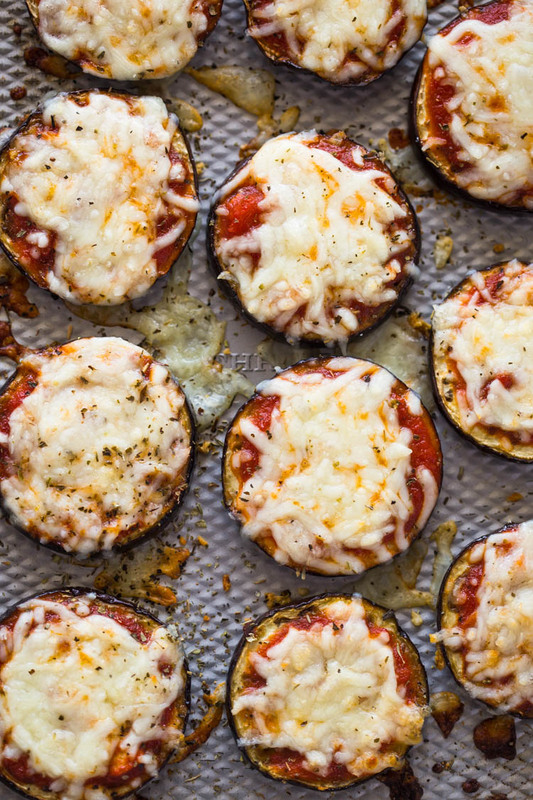 Eggplant slices topped with garlic, pizza sauce and cheese. These simple bites are made with just 6 simple ingredients in under 30 minutes and make the perfect healthy low-carb snack or meal. Small bite sized food are my favorite type of meals to munch on. 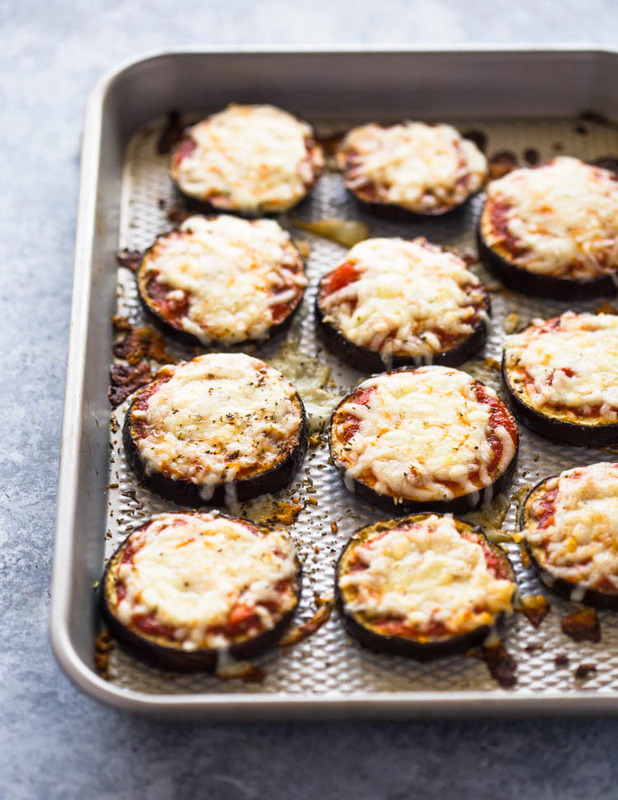 I’ve posted a low-carb cauliflower crust pizza, a broccoli crust pizza and now it’s time for an eggplant crust pizza. 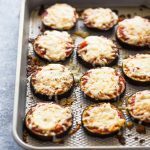 Instead of shredded the cauliflower and broccoli like the other pizzas, this eggplant pizza is much easier to make. To make the crust, you simply slice up an eggplant into thin slices and that’s it! Top it with olive oil, garlic and italian seasoning and bake until tender and then top with your favorite marinara sauce and cheese. 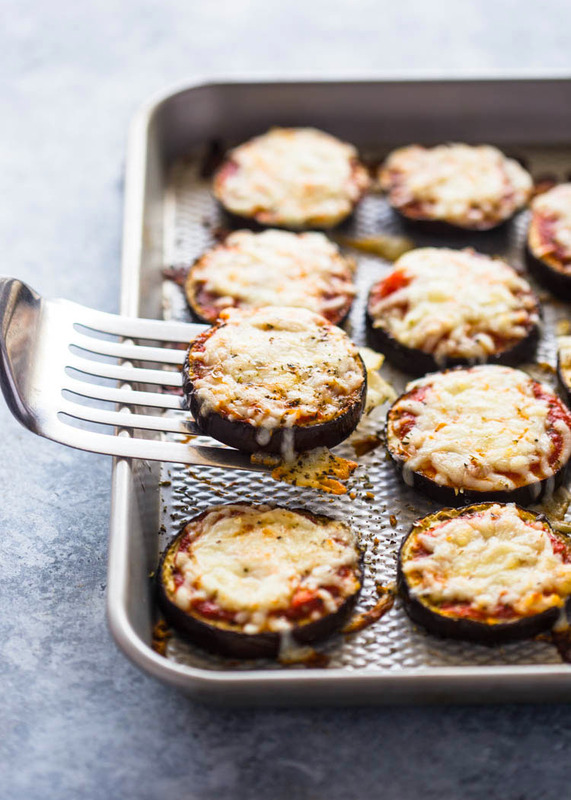 Bake until bubbly and enjoy these healthy eggplant pizza bites for lunch, dinner, or a snack! Sprinkle the eggplant with the coarse salt, let sit on paper towels for 10-15 minutes and wipe dry. Preheat oven to 400F. In a small bow, combine the crushed garlic, olive oil, and italian seasoning, Brush the mixture onto both sides of the eggplant slices and bake for 15 minutes. these I think I actually like better than eggplant parmasean! some of them just had the seasoning brushed on with olive oil and the cheese. that was also great! Why does this say prep time is 10 minutes and total time 35 IF already in the two first steps you spend 30 minutes preparing the aubergine to start cooking? We live in Ecuador and its not always easy to have special diets in a foreign country, and my daughter is gluten free, so she misses pizza. Your recipe seemed like a great alternative, so i tried it out. We really enjoyed it. Thank you so much. I made a few alterations since we live in Ecuador, check out it out http://4000miles.com/gluten-free-pizza/ Thanks so much!! Yum, thanks for sharing the photos. It looks amazing!